It’s that time of year again – or perhaps it isn’t – when Halloween-themed online slots start to come to the fore so here we have Pumpkin Bonanza, a release from Playtech with a cheery take on this spooky time of year; it comes with a clever base game feature and you can find out how it all works right here. 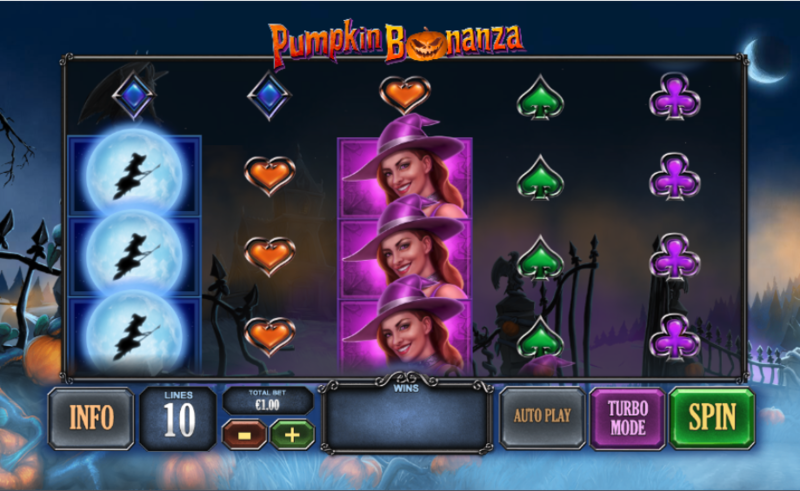 Pumpkin Bonanza is a five reel slot with four rows and ten fixed paylines; through those gloomy, opaque reels there’s a misty vista of pumpkins, buckled railings and a foreboding forest in the distance. There are three theme-related symbols and these are a witch/full moon, a witch and a scarecrow; lower values include playing card symbols in red, green, purple and blue. In this game wins can be formed from left to right as well as right to left as long as those combos start in reels one or five. The wild is a fiery pumpkin which will substitute for all other symbols to form winning combinations; it only appears during its own feature which is explained in more detail below. This ingenious feature is triggered when there’s a potential win from left to right and right to left – i.e. there are two matching symbols in reels one and two and also in reels four and five; any of those symbols on reel three will now become wild when it stops spinning. If this results in a win then you’ll also trigger the Bonanza Spin in which all winning symbols on reels two, three and four will transform into wilds for (hopefully) a big win. 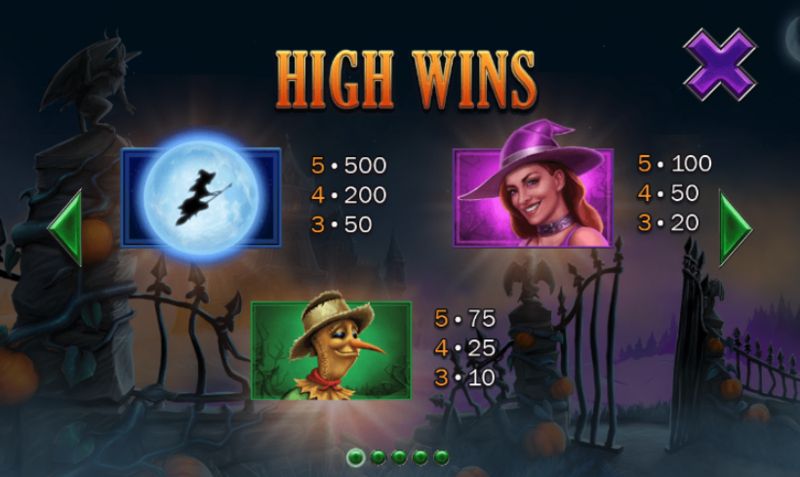 Pumpkin Bonanza is a slot with a clever base game feature which seems to offer some big wins fairly regularly via the Pumpkin Wilds; it’s spookily low key with an entertaining soundtrack and an RTP of 95.51%.